As Islam's visibility in global society increases, Muslim populations grow, and Muslim countries compete to take up positions at the heart of global sport, the interplay between sport and Islam becomes ever more illuminating. 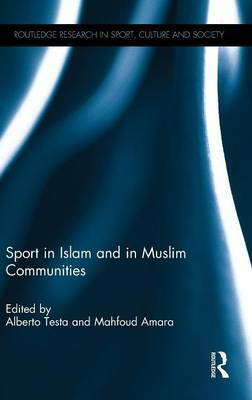 Sport in Islam and in Muslim Communities is the first book to analyse this relationship through a pluralist lens, exploring the questions it raises about contemporary Islam, globalisation, and the challenges faced by (in particular young) Muslims in negotiating their place in global society. With contributions from Muslim and non-Muslim authors, the book approaches an array of contemporary issues, from the role of sport in gender, youth and political identities in Islam and Muslim societies to sport policy in Muslim countries, sport's role among Muslim minorities and sport marketing's relationship to Muslim cultures. Drawing on sociology, anthropology, political science, Islamic studies and sport studies, Sport in Islam and in Muslim Communities not only examines the significance of sport in Islam, but helps to draw wider conclusions on religious identity in sporting settings and the interplay between sport, gender, political ideology and consumer culture.